Keep Informed of my new posts. Sign up for notifications. Click here. Find out more about my blog using tabs below. I’ve got a little special “Wine-Sum-More” edition today. As you may know, beginning this past Monday, and extending for another two, I am reviewing three different Chardonnays from Three Sticks Winery. As an “Extra,” I’m bringing you another wine being released and, in fact, the winery is hosting a “Spring & Rosé Release Event” today at their Adobe. Since I am fortunate to also have the Rosé, I thought I would sway you with my review of this wine as well. Officially, the wine is known as the Casteñada Rosé 2018. Make no mistake, this is a wine from the same team that brings you all of the other Three Sticks wine. As the winery likes to describe; “Made up of mainly Syrah and Grenache, this wine has substance and presence, while Marsanne, Grenache Blanc, and Viognier provide hedonistic aromatics.” The grapes coming from the Sonoma Coast arena and is fermented in all Stainless Steel. 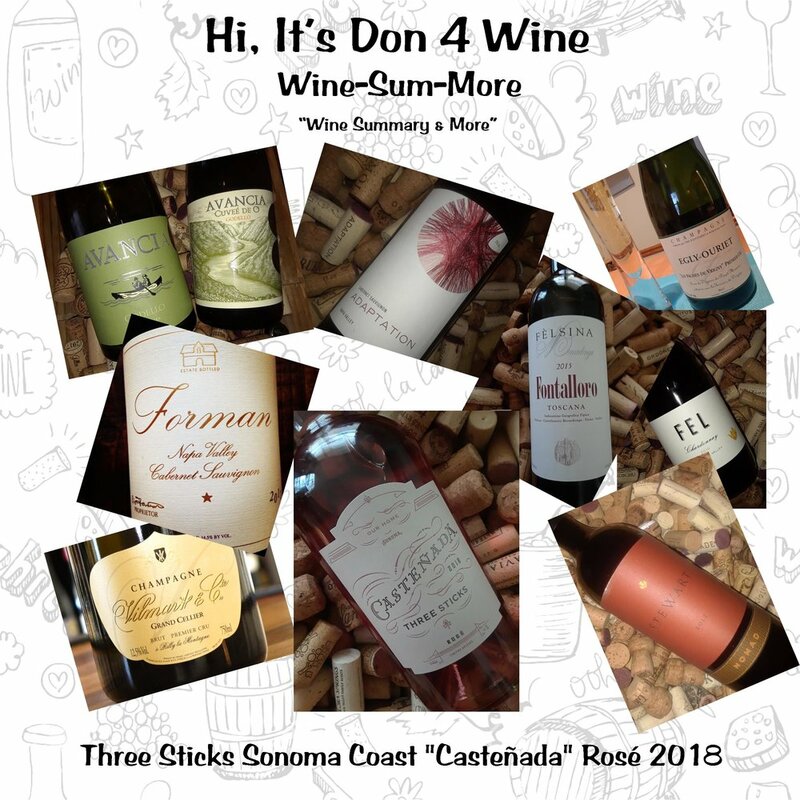 Also, direct from the winery: “The Rosé is one of three Casteñada wines honoring Don Juan Casteñada - the first owner of our Adobe tasting room. The Adobe is one of Sonoma's last remaining buildings from California's Mexican era, and we cherish the opportunity to honor it and its history with this wine.” Side note: I love the label and while the bottle doesn’t conform too well to wine racks in general, it too, is so cute! Okay, now for the important stuff! When opened you get a burst of strawberry rising from the glass. That same flavor with maybe a hint of cherry peaking your taste buds along with a wonderful acidity finely balancing the wine to make it such an enjoyable experience. What really hit me was that fine balancing act the wine exhibits. A richer fruit component but with that offsetting crispness. Finishing taut but dry, and as I said about the “Origin” Chardonnay and a comparison to a Grand Cru Chablis, this wine should be what a Rosé from maybe the Tavel region of France should aim for. Only one thing. A scant 180 cases of the wine was produced. It’s only available to club members and folks on their allocation list. So be smart and sign-up, who knows, maybe they’ll still have some, if not, at least you’ll be there for next year. Keep informed of my new posts. Sign up for notifications. Thank You.